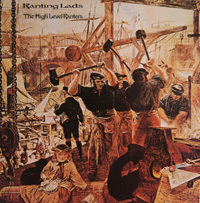 The High Level Ranters were among the liveliest folk music groups in Britain, one of the longest-established and most popular bands. The incredible instrumental versatilty of the four piece – Alistair Anderson, Tom Gilfellon, Johnny Handle and Colin Ross – took the music of their native Northumberland around the world. The group researched much of their repertoire from 19th century tune books, helping to revive and bring before a new audience a vast repertory of local traditional music. All members of the group recorded solo records, but their most powerful recordings were undoubtedly made as an ensemble.